On Saturday night, the UFC will return to our screens with UFC 236. The card, which will go down in Atlanta, Georgia, registers as the first to be topped by a pair of interim title fights. 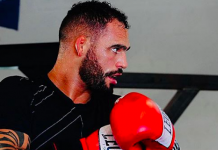 The first of these interim championship bouts will occur in the middleweight division, where undefeated striking ace Israel Adesanya will look to defeat brick-fisted wrestler Kelvin Gastelum. The winner of this fight can expect to unify their title with the undisputed belt owned by Robert Whittaker sometime later this year. The UFC 236 main event, meanwhile, will occur at lightweight, where reigning featherweight champ Max Holloway steps up to 155 pounds to battle streaking contender Dustin Poirier for interim gold. The winner of this fight will be on a crash course with undefeated, undisputed lightweight champion Khabib Nurmagomedov. 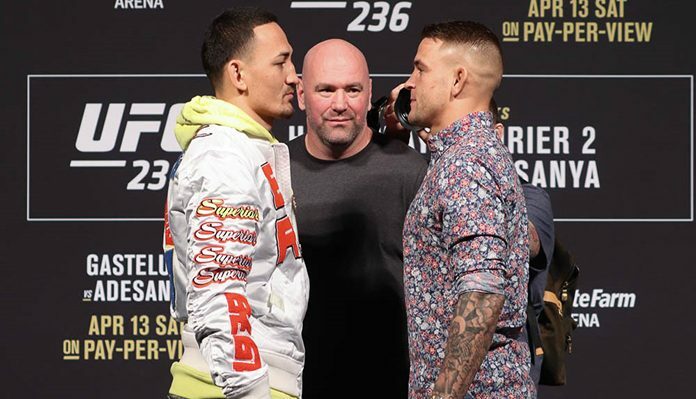 On Friday morning, Max Holloway, Dustin Poirier, Israel Adesanya, Kelvin Gastelum, and the other fighters on the UFC 236 bill stepped onto the scales to weigh in for their respective battles. Luckily, all four championship fighters hit their marks!